Day of rest. Went to church. It was a Fast Sunday, so we had a Fast and Testimony Meeting. Joseph, our seven-year-old, decided to bear his testimony. He went up completely unassisted with a copy of the Book of Mormon in his hands, and to our surprise read out of 2 Nephi 21:1-8, where Nephi is quoting the prophesy of Isaiah about the Second Coming of Christ, which you can also find in Isaiah 11. Interestingly enough, that is about the part where most people stop reading the Book of Mormon. Yet of all the parts of it that Joseph could have picked for sharing, he for some reason chose that one. We do expect our kids to know the scriptures, but I must admit this was quite a surprise for me. The unusual events of the day did not stop with Joseph's testimony. In the next hour I taught a class for new members and investigators. There were five people in attendance in addition to myself, and none of them spoke English as a native language. The native languages were Russian, Korean, and Spanish. Fortunately for me the Spanish speakers were fluent in English and did not need the translation. One Korean speaker was assisted by her sister-in-law. I translated for my mother into Russian after saying it in English. The Elder's Quorum was the only class where nothing too unusual happened. We learned about being in the middle of things from Elder Uchtdorf's message in the Ensign. A.M. Started with an 800 meter time trial with Benjamin on the track. I was concerned about my ability to pace, as Benjamin is fast, and the distance is short. But I did OK. The target was 2:24, and I would have been happy with 2:26, but the plan was to pace him through the first lap in 72 and then see what happens. Benjamin was a bit aggressive in the first 100, which we did in 16. 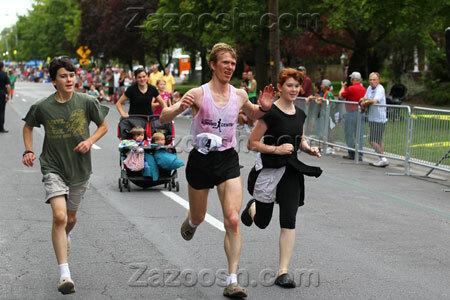 After that I told him to get really behind me and not push the pace from the side, and the pace became more reasonable. We did the next 500 meters hitting each 100 in 18, with 34 at 200, 70 at 400, and 1:46 at 600. Benjamin took the lead at 300 as we had planned. The idea was that if he knew he was supposed to take the lead, he had something to think about for the first 300 to get his mind off the worries about being able to sustain the pace. I took the lead back immediately after 400, and Benjamin took it again at about 540 again as planned. The idea was that this would give him a confidence boost, help practice for competitive racing, and also keep me from second-guessing how fast he wanted to go for the remainder of the run. At this point it felt really good to be behind him. I relaxed and did not try to pass him back on the curve. At 700 I found out why it felt so good - our next 100 was 19. So I moved out to pass him, but not very fast. This reluctance to accelerate came natural to me as I was quite tired, but it was just perfect for Benjamin because it stirred his competitive juices without mentally destroying him, and he picked it up. Our last 100 was 18 with the total time of 2:23.1. This was very good preparation for the assault on the 5:00 mile barrier. Benjamin proved that he can run a significantly faster pace for half the distance, and that his second lap can be faster than the target pace, not just the first. Our next step is to take a break from the track next Tuesday and show the 6:00 guy who's the boss for 3 miles going down the Provo Canyon, and then the Tuesday after that try 1200 in under 3:45. So far, however, we are on track to break 5:00 before Benjamin turns 14, which is exciting. Now when he turns 15, it is quite likely that I might only be able to pace him for the first 800, and maybe the last lap in his mile time trials. But by then he can just run a competitive track race instead. We ran some more miles after that, I ran with the younger kids, and some alone. Benjamin ended up with 6 miles, Jenny, Joseph, and Julia did 2, Jacob ran 1. I did a pickup for a quarter down the canyon in 76 chasing another runner. His name was Tony and he was visiting his family from California. We had a good talk. A.M. Total of 12 miles. Joseph wanted to do a time trial. So I ran 2 with Julia, 4 more alone, then took Joseph, Jacob, Jenny, and Benjamin to the track and we helped Joseph get a good time in 400 meters. It took some persuasion to get Jenny to run fast - her excuse over the last year has been that her muscles are hurting from the growth spurt. That was indeed the case, but with that came also a mental issue of being afraid to run fast. So today I said we've had enough of that and told her she had to at least try. She reluctantly agreed to participate in pacing Joseph, which was of great help. However, Jacob was the key element. Joseph's goal was sub-90. In the previous attempt he ran the first 200 in 43, followed by 50, which gave him 93. I knew that Jacob could run 200 in 47, he's done it before. I also knew that there is no way in the world that Joseph would let his younger brother Jacob finish ahead if he had even an ounce of strength remaining, and even if he did not. So we had Jacob start 200 meters into Joseph's time trial, and about 1 second in front. Joseph, Jenny, Benjamin, and I went through the first 100 in 20. I knew the pace was too fast from the start, but I did not want to slow it down, and decided to just watch and see what happens. I wanted in particular to see how Joseph would fare against Jacob after a fast start. There was some easing off in the next 100 which was done in 23, giving us 43 for the 200. It appeared at first that Joseph was headed for a gradual decline. However, the presence of Jacob running in front stirred him to action. The next 100 was in 21 giving us 64 at 300. At that point I knew sub-90 was in the bag for Joseph. Jenny was also excited by the presence of Jacob, and pushed some to pass him. She finished in 85, which is technically her new record, although I believe she should be able to run quite a bit faster, sub-80 for sure, on a good day, if we can just find one. Jacob and Joseph finished together. Joseph's time for 400 was 86, 4 seconds ahead of the goal, and 43 for the second 200. It is quite remarkable that he managed an even split after a jack-rabbit start. Amazing what a younger brother placed at a strategic location can do for you. Jacob did 44 for the 200, which is his new record. With the proven ability to run sub-3:00 800 pace for half the distance, Joseph is now on track to crack the 3:00 barrier in the 800 in the Thanksgiving race. I believe he may need to do that to win this year. His main competition is Ammon Blackburn who is a year older. Joseph will still be 7, and Ammon will be 8 on the day of the race. Ammon could very well run under 3:00. Benjamin's course record of 3:00 in that division is definitely under threat this year. Afterward we ran home, and I ran 4 more with Benjamin. So Benjamin did 6, Joseph, Jacob, and Jenny did 2, I ended up with 12. A.M. Ran with Benjamin and Ariel. Did a tempo workout - 3 up and 3 down the canyon with a few minutes of rest at the top. Benjamin paced me through the first mile, I ran the rest of the workout alone. The first mile was 5:56, then 5:57, and 5:53 - 17:46.8 for 3 miles. It was good to do sub-6:00 on all of those miles with pacing only on the first as opposed to on all. I think there was some tailwind, because on the way back there was noticeable headwind. I struggled on the second tempo. Part of it was the headwind, part I think being tired from the first one. My splits were 5:33, 5:35, 5:27 - 16:35.4 total. Got home, ran with the kids. Jenny, and Julia did 2, Joseph 2, Jacob 1. Benjamin did 6.8. I did a total of 13. A.M. Ran with Benjamin and Ariel, then with the other children. Benjamin did 6, Jenny and Julia 2, Joseph 3, Jacob 1. I ended up with 13. Did a pickup for 0.5 in 2:36. A.M. Started the run with Scott, his friend Reed, Chad, and Matt Poulsen. I had not seen Matt since he graduated from BYU, so it was nice to see him again and running. 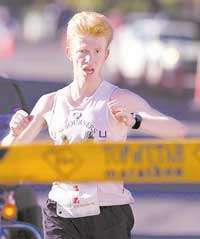 Matt was a 14:04 5000 meter runner back in the day. The group gradually thinned out as people reached their target turnaround points. By the end of the first 10 it was just me and Scott. We ran a tempo on the way back. It was much nicer to do this run with a partner. This run is one miserable run. It is hard to find somebody who is fit enough, up for the pain that day, and has a schedule that works out, but finally I was in luck. Scott and I traded leads with shifts of about 0.5 miles for the first 7 miles. The pace had been around 5:33 or so on average up to that point. Finally the pace and the heat started to get to me, and I had to draft. With about 2 miles to go we gradually pulled up to Reed, who was doing a tempo run of his own, and he was able to join us for about a mile, which we did in 5:37. The last mile was uphill, and more exposed to the sun. I struggled on it, so it was 6:03. Total time for the last 10 was 55:54, which is my new record in this workout. Total time for 20 was 2:10:01. Benjamin did 6, Jenny, Julia, and Joseph 2, Jacob 1. Day of rest. Went to church. The Sacrament meeting talks were on the birth of the United States and its role in the Restoration of the Gospel. One of the hymns was My Country 'Tis of Thee. I remembered some things. 2 Nephi 1:6 "there shall none come into this land save they shall be brought by the hand of the Lord". At the age of 16 while still living in the Soviet Union I had a strong feeling that I needed to learn English fast - my future would depend on it. Over the next three years I would study for 8 hours a day if I could find this much time. I practiced it at every opportunity. The entire time I never felt that I was learning a foreign language, but rather was learning a native language that was technically not native because I never learned it as a child. But it was nevertheless somehow native regardless. Later when I joined the LDS church and started reading the Book of Mormon, I began to understand why it was so. Our country is different in a special way. I wish we understood it better. It is not a reason to be arrogant, rather it is a reason to feel a strong sense of responsibility to keep the commandments of God, and to serve others. Along with that I remembered my adventures in getting a US Visa. What a mess! And what an eye opener! An African American in the 50s was more privileged and less discriminated than a young man with a dream from a country with less developed economy and unstable political situation applying for a US student visa. "Give me your tired, your poor, your huddled masses yearning to breathe free" on the Statue of Liberty not surprisingly is viewed in a way that is more or less similar to "we all need to eat healthy and exercise". A principle we theoretically admire and are anxious to preach from the pulpit but lack the grit to practice when initiative and sacrifice are required. I also remembered the feeling of disappointment I experienced when I observed some people getting drunk on the 4th of July. I understand some people will take issue with this, and argue that there is nothing wrong with celebrating the American freedom this way. I used to argue back, including on this blog, but I think I am going to take a different approach. If you feel this way, go to the Lord in prayer and asking to show you why it is wrong, and if you really care to know, He will. If not, well, there is not much else I can say. I will quote a scripture, however - Isaiah 28:7 "But they also have erred through wine, and through strong drink are out of the way; the priest and the prophet have erred through strong drink, they are swallowed up of wine, they are out of the way through strong drink; they err in vision, they stumble in judgment." Somebody in my ward asked Sarah if I felt excluded on the 4th of July due to my non-US upbringing. I do not feel excluded. I feel thankful to be in a country that the Lord has prepared and freed for a special purpose. I do feel sad, however, particularly on the 4th of July, when I contemplate the degree of ignorance among Americans to that special purpose. A.M. Ran with Ariel and Benjamin. We did 6. Did a pickup for 0.5 in 2:37. Then more with other kids. Julia did 1, Jenny and Joseph 2, Jacob 1. A.M. Took Benjamin for a time trial of sorts. I wanted to see what he could do on my 3 mile tempo course down the Provo Canyon. The target was something under 6:00 average, but we both knew that he would blow that away, the question was by how much. After a 2 mile warm-up uphill we started the run. I ran alongside for about a quarter to feel how fast he wanted to go, that quarter was 87, which had some uphill, then I moved forward and started setting the pace. We did 82, 82, 82 (5:33), then 83. I knew that those 82s would eventually end, but I figured as long as Benjamin was not complaining or falling back, I would hold it. The nice downhill ended, the next quarter was rolling. Benjamin started to struggle and hit 89. However, he regrouped and sped up to 86, followed by 87, which was not too bad. 11:18 at 2 miles, 5:45 for the second mile. I told him he was 2 seconds ahead of the 5:40 guy. He protested vehemently against the idea of working to stay ahead and insisted he had no juice. I knew that he was wrong, so I told him to be quiet. I knew he would be thankful in a mile. Sometimes you just need to throw away the things they tell you in child education/psychology classes and go with the natural father's instinct. Especially when the pace is 5:45, which I can handle, but I am definitely in no mood to talk going this fast. So I condensed my remarks to one phrase. It worked quite well. He had two quarters of rebellion in 89 and 90. Then he smelled the barn, repented, and ran 85. At this point I thought all hopes of breaking 17:00 were gone. But Benjamin thought differently. He ran the last quarter in 76, which gave him 5:40 for the last mile, and 16:58.2 for 3 miles. This was a decent time, given that my best on that course is 15:15. Day after day Benjamin is becoming a more equal workout partner, and pretty soon I am going to hear "Daddy, give me five" as he tries to make me go faster. I ran 6 more afterwards. Jenny, Julia, and Joseph did 2, Jacob ran 1. A.M. Ran 6 with Benjamin, did a pickup for 0.7 up the canyon at 5:45 pace, then more with the other kids. Jacob and Julia did 1, Jenny, and Joseph ran 2. I ran some more, found Jon Kotter on the trail, ran a couple of fartlek intervals with him. On the first one I was able to stay with him for about 40 seconds, then eased off and finished in 3:39 the distance that he covered in 3:22, which was probably around 0.75 miles. He thought that pace was sustainable for him for a little longer than a mile, but definitely less than 5 K. On the second one, I ran the first minute of his two minute interval. On the last one I stayed with him for the first 50 seconds of a one minute interval, and then finished it out to the minute maybe a couple of seconds behind, except he ran for maybe 65 seconds or so. So I ended up with about 13 miles total distance. Benjamin got back his AP Calculus BC test score. It was 4 out of 5. Not too bad for a 13 year old taking his first official test ever. This gives him credit for Math 112 at BYU. Math 110 as well, but it is irrelevant given that 110 is a prerequisite for 112. We will try to hit 5 next year with more maturity and test taking experience so we can move Math 113 out of the way as well. A.M. Trip to Zion's Park. In St. George ran with Clyde and Benjamin. Clyde did 8, I did 10, Benjamin did 6. Then I added 2 with Julia and Joseph. Jacob did 1. P.M. 0.5 with William, 2 with Jenny. A.M. 6 with Benjamin, we did a pickup for 1.5 at sub-6:00 pace. 2 with Jenny, Julia, and Joseph. 1 with Jacob. A short pickup with Jon Kotter for a minute at about 4:30 pace. Another pickup at 5:44 pace uphill for 0.5. Total of 12 miles. A.M. Today was the Deseret News Practice Run. I had two purposes. Measure how long it takes to get to the start of the race from my house following the magic route through Heber, Kimball Junction, and Jeremy Ranch road; and to run the first 16 miles of the course to remember what to expect, as I have not done that since 2008. Time flies. So I drove up with Ariel. It took 1 hour and 22 minutes. Then Ariel drove further to do his run, and I ran the 16 miles. 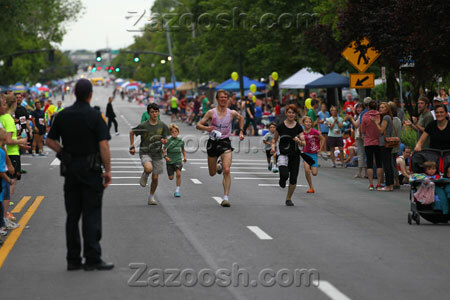 I started right by the Morgan County/Salt Lake County sign, but I think that was wrong because my first mile was 6:19. I think part of it was starting at the wrong place, but part also was just from running too slow - I started with zero warm-up, and had a hard time kicking into gear. The subsequent miles were more normal, but still slow, considering I was going down 8% grade. 5:43, then 5:29 I think. 29:02 at 5 miles. Still feeling sluggish. To make matters worse, somehow I managed to run the 6th mile in 6:24. It had some uphill, but not that much. It should have been at least 6:10. The next mile up the Little Mountain was 6:58, followed by 6:19 which was about half up and half down. When I saw 48:43 at 8 miles I told myself it was time to wake up and try to start running. I was not sure if I did have that wake up in me, but the next mile showed I had at least some juice - 5:23, followed by 6:01 10th mile which has a detour to the subdivision. It was a bit slower than it should have been because I slowed down looking for the turnaround sign. It was not easily visible I did find it painted on the road, however, and with that obstacle past me, got going again. The mile split was 6:01 with 1:00:07 at 10 miles. It was getting warmer, and I was running without water or fuel. However, the next two miles were good - both in 5:33. It felt too aggressive in the anticipation of the Hogle Zoo monster encounter, so I eased off a bit, and ran the next one in 5:38 - 1:16:51 at 13 miles. 15 mile split was 1:28:21 - the miles were 5:48, 5:42 I think. The last mile had the notorious Hogle Zoo bump that can help you evaluate how much glycogen you and your competitors have left in their legs. If there is a decent amount, it feels like a bump. If not, it feels like an endless climb, which is a bad sign because you still have more than 10 miles left. This mile was 5:54, it felt more like a bump than an endless climb, and I was happy with that. Total time was 1:34:14, with which I was not as happy, but since the last 8 were decent, I can claim that the first 8 were just a warmup. I was also happy that Ariel showed up in my car and rescued me from the Hogle Zoo monster right as he began chewing on my quads and calves. There was some damage left, though, and I could feel it. It should heal up and get stronger on the day of the race. The kids ran on their own, all except William and Joseph. Benjamin did 6, Jenny and Julia 2, Jacob 1. P.M. 2 miles with Joseph. Julia ran 0.5 with William. Day of rest. Went to church as usual. Was tired, fell asleep during one of the talks. Getting up at 5:00 AM twice last week got me. Caught the other talk, though. It was on unity. Then went to the investigator/new member class where we had a lesson on creation, and then we had the Elders' quorum lesson on missionary work. A.M. Ran with 6 Benjamin, 2 with Joseph, and 2 myself. Jenny and Julia did 2, Jacob 1. Jacob did a mile time trial. We tried to break 7:30. He started OK, but was having an off day. His laps were 1:50, 1:54, 1:56, 1:57, and the total time was 7:40. We will try again on Friday hopefully with better results. My legs were quite sore from Saturday, mostly quads, but also calves. So I ran only 10 total. A.M. Did a 400 meter time trial with Benjamin on the track at Orem High. Took him through the first 200 in 31, then let him take over to see if he could drop me, but he got a bit complacent and did a 17 for the next 100, so we were 48 at 300. After that both of us tried to accelerate, but had a hard time shifting gears. So we ended up with 64.8. Next time we try this, I'll just have him try to outrun me in the last 100. Nevertheless, it was a good result for speed given that we have not worked on this distance at all, and he is only 13 years old. Then we paced Jenny through an 800 meter time trial. It started with some confusion. I told her to go through the first 400 in 90, and then if she could not keep the pace run the best that she could. She went through the 400 in 90 and then stop because she felt she could not hold 90 anymore. So we clarified the confusion, gave her some time to rest, and made the best of the situation. Now she was too tired to go with the plan A, so we did the plan B. First lap in 95 or so, and then try to hold it. She was too scared and ran 98. Then I told her she could break Joseph's record if she sped up, and she did closing in 94 with the total time of 3:12. This is the first PR in distances 800 or longer that she got in over two years. Then we ran home and ran with other kids. Julia, and Joseph did 2, Jacob did 1. Benjamin total of 6. I added 6 more after that for the total of 12. A.M. 6 with Benjamin, 2 with Jenny, Julia, and Joseph, 1 with Jacob, 1 more alone, total of 10. Tapering for Deseret News. A.M. 7 with Benjamin. Jenny and Julia ran 2, including 1 with Jacob. I ran 2 more with Joseph, and 1 more alone. Felt like turning the legs over a bit and ran 0.5 uphill by the house at 5:30 pace. A.M. Today was Jacob's last chance to break 7:30 before turning 6. So we did a time trial on the track.We drove to the track so that Jacob would not have to run too much for his warm-up. A little kid needs only maybe a quarter mile jog, no more, before a mile time trial, and he does need to do strides. Joseph, Jenny, and Benjamin were assisting in addition to myself. Aside from bragging rights a personal Palm Pilot was at stake. Yes, I know Palm Pilots are old, but my income, while good and sufficient for our needs, does not yet allow us to provide more expensive devices for a 6 year old even if they earn them. In the meantime, Palm Pilot can be used to read the scriptures, to play chess, and to learn about various mathematical functions on the calculator among other things. Jacob was quite excited about the prospective of owning his first electronic gadget. The first lap was 1:52, just as planned. On the second lap I became concerned because we did it in 1:55 with me having to keep asking Jacob to give me a low five. So Joseph, Benjamin, and I explained to Jacob in no uncertain terms that he needed to speed up. His natural tendency to obey came handy, and he sped up completely on faith believing that even if he thought he could not do it, if Joseph, Benjamin, and I thought that he could, then he could. His third lap was 1:50. This dropped Jenny - she said she was not feeling good. We do need some instruction that when you are helping your little brother in a time trial, even if you do not feel good, you should just push through it and keep the pace. But it was not the time for this type of instruction as we were trying to get Jacob to do another lap in 1:50, which would give him 7:30 for the mile. He hesitated some, hitting the next 200 in 57, so now he needed a 53. Then he got going and hit 26 for the next 100. Now he had it in the bag, more or less, but a 5 year old kid never has it in the bag. He can always panic and slip to some out of character pace, and lose the precious bird that was already in his hand. So in the last 100 I started clapping out the rhythm and saying ta-ta-ta, as Benjamin and Joseph kept cheering. His last 100 was 24, and he finished the full mile (not just 1600!) in 7:27.8. I ordered the Palm Pilot as soon as I got to the computer. Jenny, Benjamin, and Joseph ran back to the house (about 1 mile), while I drove Jacob. Afterwards, Joseph and Jenny ran another mile with me, and I ran 2 more with Julia, and 3 more alone with a pickup in the last 1.5 in 8:36 - this gave me the total of 8. Benjamin ran 6. A.M. Ran 8 miles with Chad. In the first 2 miles we ran with Jenny, Julia, Joseph, and Jacob. Today was Jacob's birthday. He turned 6. Then we ran 6 more miles with Benjamin. I thought it would be good for all of us to shake the legs out, so I proposed a 1.25 mile pickup down the Provo Canyon. I gave Benjamin a chance to pick the pace, he said if I let him choose the pace, it would be 8:00 mile. So with this deferral, I said the pace would be 82 seconds per quarter (5:28 per mile), and I would run in front to set it. We did the first quarter in 82 as planned. However, to do that we had to work against a gust of headwind. So applying the same effort the second quarter ended up being 80. I noticed that Benjamin was fine at 80, so I just kept it. But it ended up being too fast for Chad and he dropped back a bit. The next quarter was not marked, however, we did the next half mile in 2:38. I suppose I was getting a bit excited. So we had 5:20 at the mile. Then I realized that if we ran under 76 Benjamin would get a mile record for the last mile of the pickup. So I silently picked up the pace to see if he would respond. He did. Our next 200 was 37. In the last 200 I cranked it up some, and Benjamin kept responding, and even trying to pass me, so we ended up with 33 for the last 200, 70 for the last quarter, 6:30 for 1.25, and 5:08 for the last mile. This is Benjamin's new canyon mile record. Chad finished .1.25 in 6:46, with the last mile in 5:24. Day of rest. Went to church as usual. The Sacrament talks were on the Atonement of Christ. Then we had a lesson on Alma 32, which talks about faith. I have some thoughts about faith. When we teach a child to do something that he struggles to have the initiative to start or finish we may sometimes use a reward. At first the reward has to be immediate. As the child matures, the reward can wait longer and longer. Eventually he does what we've been trying to teach him with no external reward as he recognizes the intrinsic value of what he is doing. That is what God does with us in matters of faith. For example, when we first begin to pay tithing we may receive dramatic blessings such as extra money appearing out of some unexpected source to take care of an urgent problem. I suppose the Lord knows this commandment is difficult, as such blessings seem to continue for a long time after you first begin to pay it. But then as your understanding of the law increases, you no longer need to rely on the external physical reward. You do things that are natural in the Celestial Kingdom naturally as they appear self-evident. You are more confident than ever that something good will come out of it either now or sometime in the future, either in this life or the next, and likely more than one thing, but that is now why you do it - you just do it. The question of "what did I get out of obedience?" becomes irrelevant, in fact rather silly. You realize that it is neither possible nor necessary to scientifically itemize each blessing and tie it to some specific act of obedience. Rather you acknowledge that exercising your faith and obeying always puts you in a strong position from which you are eventually able to draw a multitude of blessings. A.M. Took Jenny, Julia, and Joseph, and Jacob for Julia's 800 meter time trial at Orem High. Jacob was supposed to do his best to hang on, Jenny and Joseph were supposed to sit back until 200 to go, then kick. Things went more or less as planned. We did the first 200 in 50, then 54 (1:44), then 53, which gave us 2:37 at 600. Jenny closed with 46 - 3:23, Joseph - 47 - 3:24, Julia - 49 (3:26), which is her new 800 meter record. Jacob fell back after the first 200 or so, but kept a good pace, and finished in 3:33 which is a 1 second PR. I was quite happy with as he proved that he can be left without supervision and still run well. This is quite an accomplishment for a 6 year old. Did a cool down, Jenny and Julia ran home, I drove Joseph and Jacob back, then Benjamin and I ran a mile with Joseph, and 5 more by ourselves. So Joseph ended up with 2 mile, Jenny and Julia 2, Jacob - 1. I added some more to make the total 12. P.M. Jenny ran 0.5 with William. A.M. 2 with Jenny, Julia, Joseph, Jacob, and 4 lb dumbbells. 7 with Benjamin. Added 3 more miles with the last 1.5 uphill in 8:28. Total of 12 for me. P.M. We went to the ultrasound. Jacob told us that he used to think that the Ultrasound was some kind of a holiday. Indeed, throughout his life we've had ultrasounds almost as frequently as his birthday. It turned out to be a boy. We are going to name him Matthew. Everything looked good and we are expecting him around Christmas. Benjamin ran 0.5 with William.